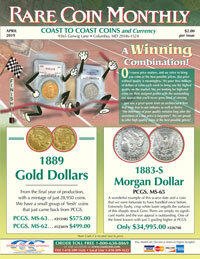 All Coins, Artifacts, and Paper Money we sell are unconditionally guaranteed Genuine. We allow you a full 14 day return privilege from the day you receive your order except for bullion orders which may not be refunded. We will repurchase bullion items at our current buy prices. Sign up below to get our monthly catalog mailed directly to you.